This was the first time in out almost 30 year history that Pappagallo’s Satellite Beach tried a wine pairing event. For those of you who have never heard of this concept (I was one of you a month ago) it’s a relatively simple but creative concept. A restaurant sets aside a night, we take reservations and serve a 4-5 course meal. We invite our wine supplier to “pair” each individual course with a wine selection they suggest from the selection they offer. I’m not a “wine guy” so we definitely needed help choosing what wines to match with each course offered. A few weeks ago we invited our wine representative in for a sampling and she sat with our distinguished panel of experts (Tricia and Nik) and the kitchen prepared some of our favorite plates to verify that there were wines available to match what we had made. This whole process started over a month ago. Of course once the food and wines were paired we had to make some flyers and add to our inventory of glassware and plates to keep on hand. I mean you have 40 people with a glass of wine per course, plates for each offering, it adds up quickly and we were determined for our first event to go off smoothly. Translated that means that the entire staff stressed over every detail for the last 6 weeks. Pappagallo’s Satellite Beach had never done this sort of thing before and we were nervous and excited to step out of our comfort zone and host that many guests at one sitting for something we’d never done before. Obviously we wanted to choose a calmer night to try this out. We intended to maybe do a Tuesday or perhaps a Wednesday. A mid week break kind of thing. That was short lived when we looked at our calendar and discovered our wine expert wasn’t available on those nights but he could manage a Monday night into his schedule. Pappagallo’s Satellite Beach really felt it was important to have a wine expert at our event to walk our guests through the “story” of each individual wine that had been selected. I don’t drink very much wine so I assumed that if the wine taste good to me and it’s under $10 I’m happy. if I can drink it through a crazy straw, even better, that’s my story of wine. I now know that there’s a specific reason for each wine chosen and different wine comes from different regions at different times of year to showcase different flavors and colors could be gained from each unique region. I further learned that they don’t provide crazy straws at these type events, which seems like a party killer to me. After weeks of hashing out every detail we could think of, the day finally came. I wasn’t scared of what the menu included because we had done these dishes before. I was however a little nervous of how we would serve that many at once. The big day came and we were as ready as we could be. It felt like we were getting ready to run a race but had to wait for the starter’s pistol to go off. Scheduled start time was 6:30 we were all wound up pretty tight. We were prepped and ready. The patio was all decked out in tablecloths and linen napkins (high class stuff here.) We had dedicated wait staff just for this evening and Lisa, our wine rep and John, the expert arrived with plenty of time to set up. Have you ever heard the expression, anything that can go wrong will? This day it really didn’t! Service was excellent if I do say so myself. The wait staff was on point delivering food and drink to over 35 guests without any incident. Food was hot, the wine flowed well and we got through our first wine pairing without anyone even crying. I have an ongoing joke with the staff that you are never truly swamped busy until someone cries. I know that sounds heartless but it lightens the situation if we can laugh about it after the fact. It was a first for Pappagallo’s Satellite Beach the wine event I mean, but we came together as a team and pulled it off with what seemed like ease to out guests. Lisa even remarked that we really pulled it off better than she expected, being it was our first time and all. John stood on a chair between courses and gave a quick lesson on each wine and what the plate in front of the diners was about. The meal service ended to our relief, relief as far as the kitchen was concerned. We stressed for weeks on this one and once every one was “stuffed” and happy we could finally breathe easy again. Fact of the matter was this first go around was mostly people who really know us and were looking forward to something different from us. There was a fair share of family there as well, which was nice but a little extra pressure on all of us to impress the people we care about most. John Asked if we would like to bring out the kitchen staff to take a much deserved bow for what they had just executed and I was very happy to give the guys the credit they had earned. Pappagallo’s has been in satellite beach area for many years and a lot of really talented and caring people have worked here over those years. Sometimes I feel a little guilty for receiving so much credit for when we get recognized for a job well done or any appreciation for what the staff does on a day to day basis. Pappagallo’s Satellite Beach crew really does take pride in what they do! On this night we had most of the staff volunteer to work their night off because they knew it would be fun to try something different and I’d like to say they saw how important it was to me to have a good showing. And they wanted to make sure I had the needed help. John introduced me as the “chef” of the evening (a term I don’t like because I’m not a chef by definition, I’m just a cook with a passion for what I do.) I thanked everyone for coming and acknowledged all the extra effort the crew put into making this night special. After receiving a round of applause that feeling I get about getting credit that wasn’t all mine returned. Then I had a thought. I’m not a trained chef so I don’t call myself one but I am a culinary conductor, that’s a new title so let me explain. A “culinary conductor” is the person who receives the majority of the credit for a performance but although he or she may take the responsibility for a performance, does little more than watch his team perform their individual tasked with the expertise they have for their own job. See I may not have a tuxedo and a little pointed stick but I do have an apron and a rubber spatula to orchestrate my team on what order they get to showcase their talent. I can live with my newly appointed self named position because it really fits what I do on a daily basis. The responsibility rests on me, it’s my job to make sure we’re ready to perform on any given day. It’s not my duty to do everything (I can’t play every instrument in the orchestra) but when it’s showtime… I’m the guy waving his rubber spatula or throwing the dough into the air for our audience to see but the players in the background are doing all the real work and making me look like I know what I’m doing. I thank them for that because on this night they all come together and made me look great! 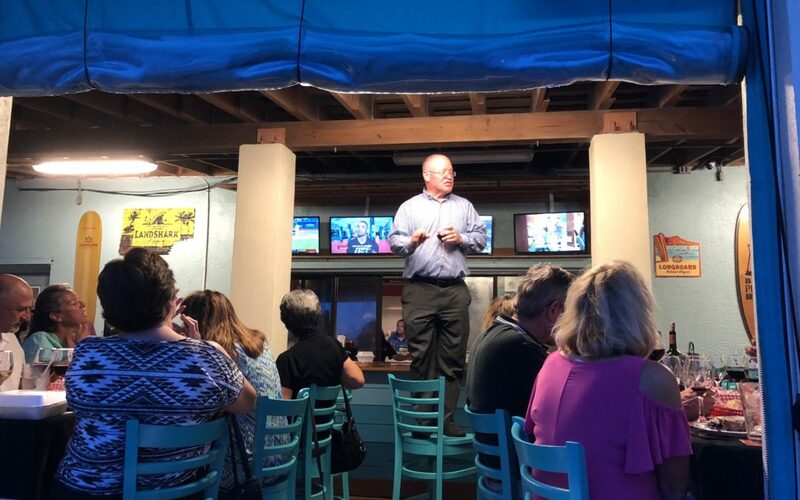 Pappagallo’s Satellite Beach first wine pairing dinner went better than I hoped so I’m looking forward to being your “culinary conductor” again next month when the orchestra no doubt will make me look like a star again.